AzhwAr had said in the previous pAsuram that emperumAn is both the good and bad deeds (puNyam and pApam) and that he is very pure. When asked, aren’t gangA etc pure, he says, in this pAsuram, that they attained their pure state because of their connection with him. This pAsuram is like an explanation to the previous pAsuram. pErALA – Oh magnanimous entity! aruL peRRAL anRE – did she not get your grace! pidi sEr kaLiRu aLiththa – AzhwAr is referring to gajEndhra (male elephant) who was roaming with a female elephant. The implication here is that he does not know anything other than roaming with his female elephant. bruhadhArNyaka upanishath 4-4-23 says “SAnthO dhAntha uparathasthithikshu:” (SAsthras, the sacred texts, say that only that person who is able to control his external and internal sensory perceptions and who dissociates himself from worldly pursuits, is fit to reach SrIvaikuNtam). Engaging with worldly pursuits instead of with emperumAn is considered as sinful deed (however gajEndhran was habituated to roaming with his female elephant). If emperumAn had protected such an entity, sin (or virtue) should be considered as what is decided by emperumAn. While gajEndhra was thinking of his female elephant, emperumAn was thinking of gajEndhra! Did gajEndra not think of emperumAn before? Thinking of his female elephant is his status, until now, says AzhwAr. Thus, birth [whether born in a noble heritage or a lowly heritage], deed [good or bad] etc are not the apt features to be considered. emperumAn’s thought (mercy) alone gives the benefit, says AzhwAr. aLiththa pErALA – Oh the great one, who protected that gajEndhra! It is implied here that if emperumAn protects one who is not apt, anything becomes acceptable when carried out by emperumAn. un than adi sErndhu aruL peRRAL anRE – did not gangA get all the greatness only after attaining your divine feet! This implies that dharmam (righteousness) is under the control of emperumAn. Isvara samhithai says “gruhIthvA dharmapAnIyam” (taking gangA who is the epitome of righteousness). gangA is referred to as righteousness because of her connection with emperumAn. He graces others to become pure. podi sEr – Siva, who has applied ashes. 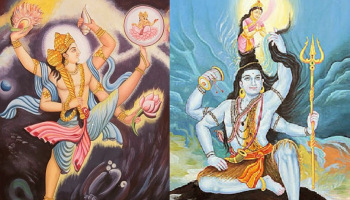 Alternatively, Siva who is reclining on ahses. anaRku angai ERRAn – Siva, who is holding fire in his beautiful hands. Other than carrying out such atonements, it is not possible to remove the sins of Siva. Even his thought that he is the controller of all is an exotic one. emperumAn protected such Siva only by keeping his original nature in mind. avir sadai mEl pAyndhu – gangA who has such water which flowed through the shining matted hair of Siva. undhan adi sErndhu aruL peRRAL anRE – despite carrying out suitable penances such as holding fire and applying ashes all over his body, Siva did not become pure. He became purified only after holding in his head gangA, who has the connection with emperumAn through his divine feet! Has it not been mercifully stated in periyAzhwAr thirumozhi 4-7-2 “nalam thigazh sadiyAn mudik konRai malarum nAraNan pAdhath thuzhAyum” (the head of Siva has become purified since he is carrying the water from emperumAn’s divine feet. The reddish konRai flower from the head of such Siva and the greenish thuLasi from the divine head of nAraNan who is the lord of that Siva…). Hasn’t ALavandhAr too mercifully stated in sthOthra rathnam 13 “pAdhOdhagEna sa: Siva:” (due to the water from [emperumAn’s] divine feet, he became Siva (purified))! Oh emperumAn! Whatever is not connected to your divine feet is not pure. There is no sin which can prevent your mercy. kUraththAzhwAn too has mercifully divined in athimAnushya sthavam 53 “yath thvath priyam thadhiha puNyam apuNyam anyath” (whatever is dear to you is puNyam, the rest is pApam).